A bicycle serves as a convenient, affordable and reliable method of transportation in the aftermath of Japan's tragic earthquake. Photo via Associated Press. 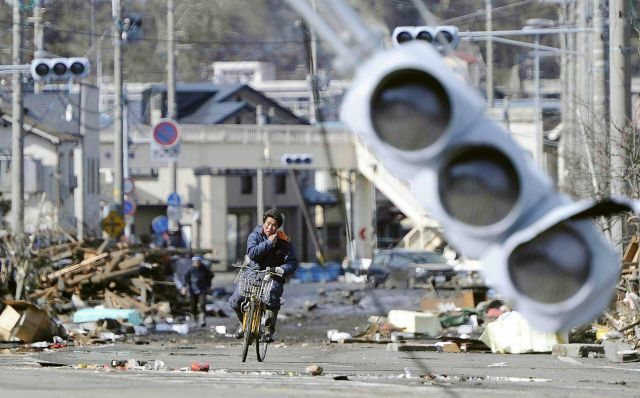 In the aftermath of Japan’s 8.9-magnitude earthquake and consequent tsunami, commuters relied on bicycles for quick and reliable transportation. Damaged roads remained in gridlock, streets lost electricity and officials cut back public transit service in the aftermath of the combined natural disasters, leaving commuters stranded and in need of transportation options. A local blogger in the Tokyo region, Tokyo by Bike, reported lines forming outside of supermarkets indicating a rise in bicycle sales. It’s not the first time bicycles have served as a convenient transportation option during moments of great disaster, according to James Schwartz of The Urban Country, a bicycling advocacy blog. Schwartz reports that bicycles played a role in both World Wars when fuel supply was low. In our previous post on TheCityFix, we wrote about the importance of cycling for re-building Haiti after last year’s earthquake ravaged its capital city of Port-au-Prince and other towns. Bicycles especially came in handy for delivering medical and food supplies, carrying heavy loads, and relocating people to temporary settlements. In general, bicycles are an excellent mode of transportation with social and environmental advantages. Bicycles promote exercise, increasing health benefits for riders; they are inexpensive in comparison to cars, which makes them affordable; and they do not cause pollution, which maintains good air quality. Bicycle’s role in relieving transportation issues during Japan’s recent natural disasters is an added bonus to an already sustainable mode of transit. If you are interested in contributing to Japan’s disaster relief efforts, please consider donating to one of the organizations below or visiting InterAction, a U.S.-based international nongovernmental organization focused on the world’s poor and most vulnerable people, to select from their list of members.